In this presentation, participants will learn about updated components in the updated NASW Code of Ethics and consider the updated Code of Ethics as it relates to the Iowa Code and federal law (including HIPAA and FERPA). Participants who complete the workshop are eligible for 1 contact hour of credit toward social work licensure. It also meets requirement for Social Work Ethics. 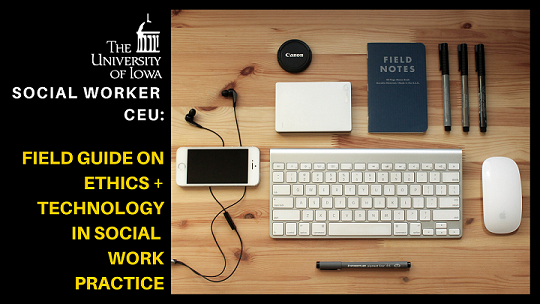 For University of Iowa current social work field instructors, students, faculty, and adjuncts the workshop is FREE. A certificate of completion will be provided to those who register in advance at http://www.signmeup.com/2Y2V1H7. Stephen Cummings, BSW, MSW, LISW, is a professor and Distance Education Director at the University of Iowa School of Social Work. Prior to this role, he was a hospital social worker for 10 years. His areas of interest include the use of cutting-edge technology in distance education, considerations for ethical use of technology in social work practice, and general professional development in social work.